September is (almost) here. Depending on where you are in life, that could mean back to school, back to work, or maybe just another month come and gone. I don’t know about you, but my summer went by really fast. I remember going on a short vacation at the beginning of May, then I blinked, and now I’m staring at the tail end of August. What gives? Anyway, there’s plenty to do on the Trails of History as autumn begins to make its presence felt. Most sites will be open on September 6 for Labor Day, but please check ahead to be sure. Congratulations to the staff and volunteers of The State Museum of Pennsylvania, which has been awarded subsequent accreditation by the American Association of Museums following a thorough self-study and peer review. Once a museum becomes accredited by AAM, it must repeat the review process periodically to make sure that it continues to meet the high (and constantly evolving) standards of the profession. For more info, go here. 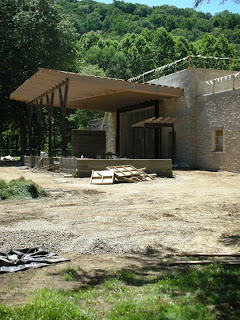 As construction continues on the expanded and revitalized main building at Drake Well Museum, the staff have posted some photos on Facebook. I’ve chosen before (above) and in-progress (below) views of the building—a new entrance and lobby are just part of the changes to come. Stay tuned. The Railroad Museum of Pennsylvania was featured last week on the blog, Mama Cheaps. Mama, along with husband Biker Bob and daughter Lily Bean, visited a number of locations in Lancaster County; their trip to the Railroad Museum was a hit. My apologies for the pretty poor quality of the photos below. Surely you can do better. And then you can enter the 2010 PHMC Photo contest to win fabulous prizes. I had the chance last week to attend a workshop for teachers at the Anthracite Heritage Museum in Scranton. The workshop, Digital Day, was put together by staff from the Northeastern Educational Intermediate Unit (NEIU19) and was attended by about a dozen teachers. NEIU has offered Digital Day workshops in the past, designed to introduce teachers to new technologies and help them learn how to use them with their students. This year, they decided to hold the workshop at the Anthracite Museum to provide teachers with interesting content to focus on while they explored software that makes digital presentations really easy to produce. Teachers spent time in the Museum galleries and underground at the Lackawanna Coal Mine Tour (sorry, no pictures, I bailed on that part), armed with digital cameras (both still and video). Museum guides (a wonderful group of volunteers) spoke with the teachers about the larger themes of the exhibits—such as coal geology, immigration, child labor, deindustrialization, home life, and religion. They pointed out objects and images that illustrate those themes and help teachers make them real to their students. I hadn’t been to the Museum for a couple of years, and I was reminded of the number of connections you could draw to issues that today’s students are familiar with. Students and teachers (and families and community members) might have some lively conversations, informed by history but very much relevant to their daily lives. After the teachers toured the galleries and had a tasty lunch (the folks at the Anthracite Museum always achieve a high level of hospitality), the tech integrators from NEIU worked with them to upload their photos and videos into Photo Story and FlipShare, respectively. Both seemed very user-friendly and adaptable to use in museums as well as schools. Great ways to employ the vast amount of visual material museums and historic sites have at their disposal. While at the museum, I made sure to catch the newest exhibit, “Just Married: 70 Years of Weddings in Coal Country, 1880-1950.” Museum staff and volunteers put out a call for wedding photos, which resulted in a lovely array representing members of the local community. Because it's a changing exhibit (and it includes so many textiles), “Just Married” won’t be on view for long, but you have until December to enjoy it. (Just a note: although lit appropriately for a textile exhibit, it's not as dark as my photos make it seem.) If you’re on Facebook, you can also see pix of the exhibit in-progress. Well worth your time (to actually go there if possible, not just look at photos). My thanks to the NEIU and to the Anthracite Museum staff and volunteers for a wonderful day. Trailheads Part II-B is a continuation of this week's post about interns on the Trails of History (which is a continuation of last week's post about interns on the Trails of History--are you starting to feel that you're in an Escher drawing?). My thanks to Cindy Kirby-Reedy, who was essentially a guest blogger for this part. Jessica Wieser is a graduate of Lancaster Catholic High School and attends SUNY Purchase, where she is majoring in Creative Writing. 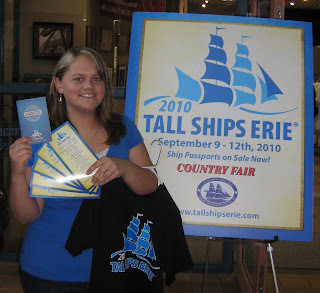 This summer, she is interning at Landis Valley Village and Farm Museum’s Weathervane Museum Store. According to Mary Parelli, the store manager, Jessica has been a tremendous help with assisting customers, taking inventory and helping with merchandising. A sophomore at Cedarville University, Anna Fitzpatrick is pursuing a major in history and a minor in music. 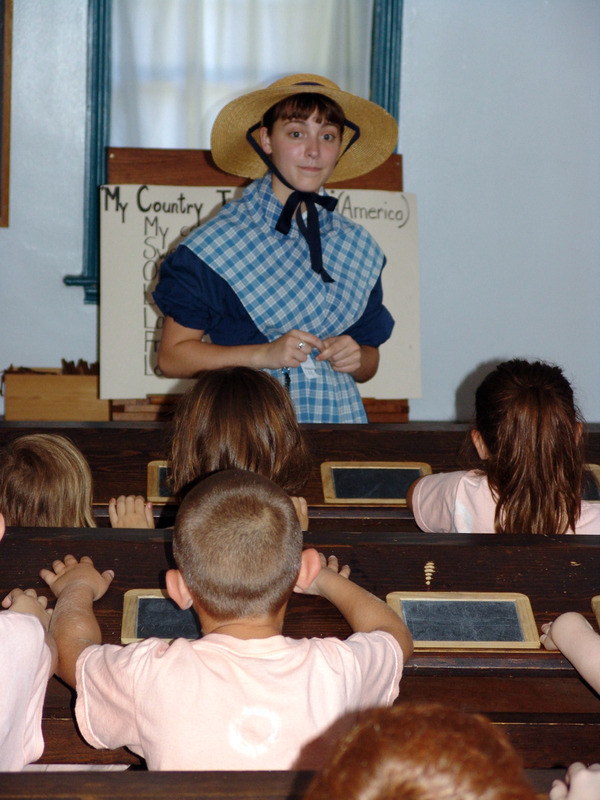 At Landis Valley, she is enjoying the experience of interpreting the Landis Brothers’ House and hopes to work at a living history museum after graduation. Anna's hobbies include knitting, basket making, reading, journaling, acting, hiking, and playing the piano and harp. Lifelong Lancaster County resident Aryel Rigano’s first exposure to the museum was in 7th grade, when she participated in the year-long Landis Valley Project. She is currently a sophomore at St. Mary’s College of Maryland and is pursuing a major in anthropology and a minor in museum studies, with the intent of becoming a forensic anthropologist. As an intern at Landis Valley, Aryel interprets textile practices in the Crafts Barn and catalogues artifacts for the curatorial department. Intern Kristie Eshelman is assisting the collections staff and performing weekend guide duties. A resident of Middletown, New Jersey, and a sophomore history major at Grove City College (near Pittsburgh), she has Lancaster County ancestors. Kristie’s career interests at present are in library science and archival management. So far, she has organized museum co-founder Henry Landis’s issues of Engineering News, re-housed publication material for a catalog on a former fraktur exhibit, re-housed some of the museum’s older construction blueprints, helped to organize the Landis Brothers’ New York City auction catalogs, and worked on data entry and a finding aid for the 50 boxes of post cards that collections volunteer Russell Eaton has organized. Originally from Dover, New Jersey, Shayla Carey is a graduate of Conestoga Valley High School. She attends Kutztown University and is majoring in Professional Writing, with a minor in Pennsylvania German Studies. Shayla’s husband, Jack, volunteers at the museum, and they have two young sons, John and Matthew. Shayla splits her time at Landis Valley between interpreting the Brick Farmhouse, giving wagon rides, and weeding gardens. Whew, that’s lot of help and good work taking place this summer. If I’ve missed anyone, please raise your hand (via the comment feature at the top of this post) and let me know. Last week, we introduced you to some of the summer interns who are sharing their skills and talents with sites on the Trails of History. This week, there are even more interns to tell you about, and Blogger didn't seem to like the number of photos, so I've divided this week's post into two pieces. 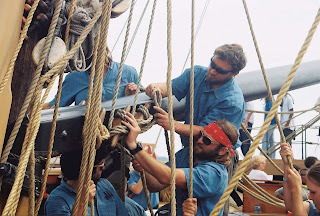 Part II-A includes interns working at Daniel Boone Homestead and Erie Maritime Museum. 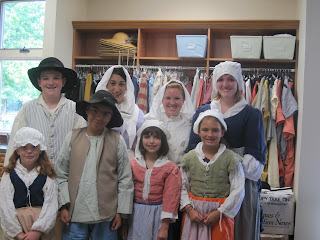 Part II-B features interns working at Landis Valley Village and Farm Museum. Many thanks to Alex Gnafakis, Linda Bolla, Carol Rosenthal, Jenna Wheaton, Jeremy Stolz, and Doug Buettner for their contributions to this post. Alexandra Gnafakis is a grad student in Museum Communication at the University of the Arts in Philadelphia. Her thesis research on the challenges of marketing historic houses and sites associated with the heroes of American myth led her to propose an internship at Daniel Boone Homestead. 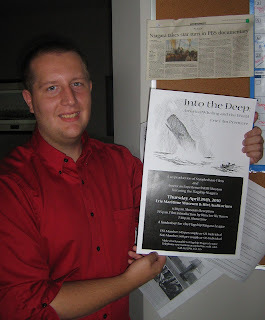 Alex has worked with staff and volunteers at Boone and has visited other Boone-related historic sites in Kentucky and Missouri. She is developing a marketing plan for PHMC and the Friends of Daniel Boone Homestead, who are now tasked with promoting the long-term stability of the site. You can read Alex’s brief description of her work here. 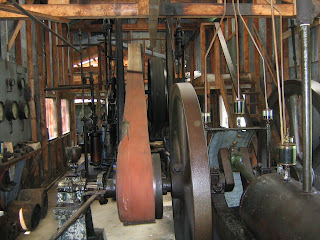 Blog continues with Part II-B, Landis Valley Village and Farm Museum. 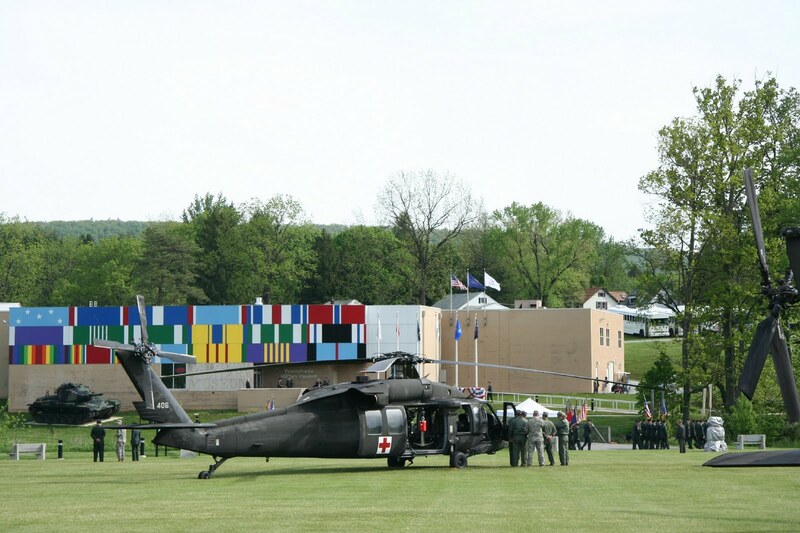 If you were intrigued last week by the video of a reenacted patrol in the rain at the Pennsylvania Military Museum’s VIETNAM Revisited program, they’ve also posted a link to one that took place with the sun shining. For links to either or both, go here and scroll to the bottom of the page. Many thanks to contributors Susan Beates, Sheri Hamilton, Marlie Manning, Sarah Buffington, Katie Ursitti, Jennifer Martin, and Diana Le. Tune in next week for more interns. 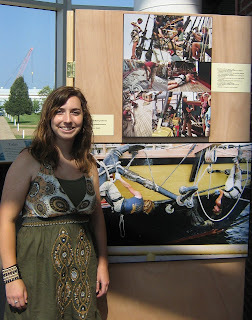 Drake Well Museum intern Marlie J. Manning (a history major at Mansfield University) tells us that she “wanted to do an internship for the experience that it will give me for the career that I have chosen. I wanted to know for sure if this career is what I actually wanted to do for the rest of my life, and after five weeks of being here I have found that it is something I can see myself doing. So far my internship here has been informative and enjoyable.” Marlie has worked with curator/historian Susan Beates on collections care, research, interpretation, and (a necessary evil, I guess) administration. 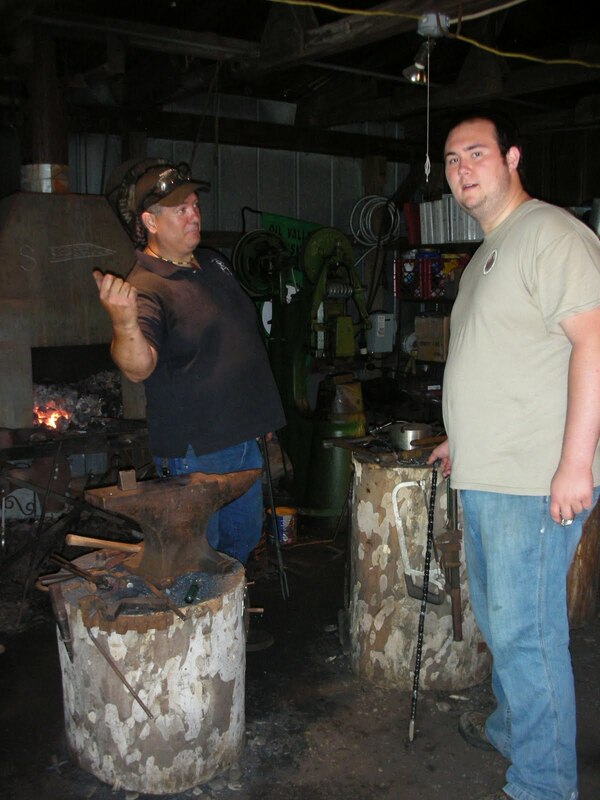 She’s also learned a few handy metal-working skills in Drake Well’s blacksmith shop (see photo above). 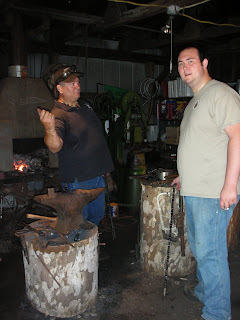 Titusville’s own Evan Ditty, shown on the right, above, with volunteer blacksmith Leon Briggs, is a history major at Thiel College in Greenville. Evan was planning to pursue a career teaching history at the college level, but his experience at Drake Well has made him aware of other history-related careers as well. Having previously volunteered with the NITRO show, this summer Evan also worked with museum collections, research, school tours, craft demonstrations and the well replica. A full summer. Old Economy Village intern Katie Ursitti (above), a history major at California University of Pennsylvania with plans to pursue a doctorate, described her summer for Trailheads. Of the many lessons she’s gained, she learned how to catalogue historical artifacts and the proper way to care for them (such as how to transport them safely from one point to another). She also experienced how to keep track of the climate in the historical buildings and what is considered good and bad conditions for the historic buildings and the artifacts. While giving tours to children from the ages of 3 to 14 years old, Katie was able to experience the joys of retelling the lessons she learned to those who are younger and eager to learn. One special moment, while giving a school tour, was when a young girl cried out “Don’t leave!” and gave her a big hug. Old Economy Village feels the same way about Katie. Some interesting stuff has come through my inbox that I thought I’d pass along now rather than waiting for the Friday post. In the photo above, a group of teachers from Ireland listen to Eckley tour guide Jolene Busher at the Church of the Immaculate Conception, constructed in 1861. The Irish Teachers Program, based at King’s College in Wilkes-Barre, has brought visitors to Northeastern Pennsylvania since 1974. This year’s group lifted the total number of participants past 1,000. The elementary and secondary school teachers also toured the Lackawanna Coal Mine and Harveys Lake and took a walking tour of Wilkes-Barre before heading to Philadelphia, Washington, D.C., Lancaster, Gettysburg and New York City. The annual VIETNAM Revisited program (held July 24-25) featured realistically hot, humid, rainy weather. 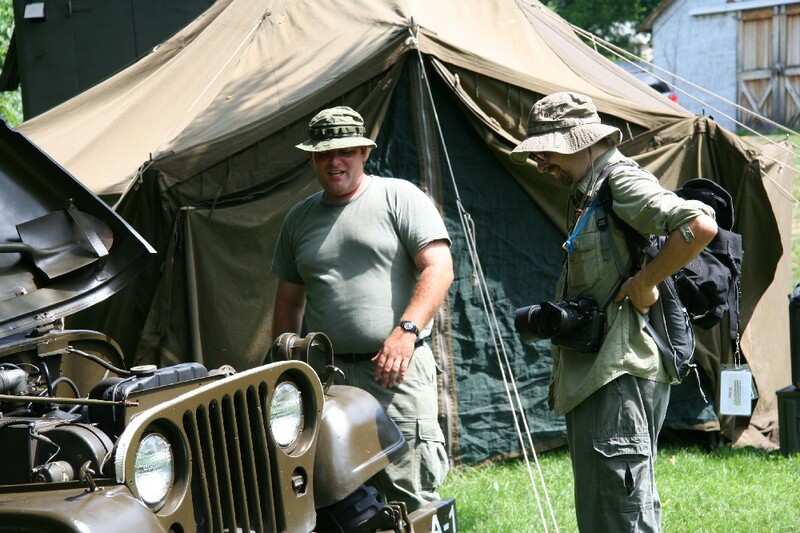 In the photo above, Reuters News Service photographer Aaron Heiner learns about the M38A1 Jeep from volunteer John Wagner, Jr. To find out more about the program and see additional photos of the event (including Mr. Heiner’s), click here. There’s also a riveting (for me, at any rate) video of a reenacted patrol on YouTube. Finally, the latest issue of Access Archives is available from the Pennsylvania State Archives—click here.